The Immersion RC Vortex 150 Mini Drone takes on many features from it's bigger brother, the Vortex 250. Coming in below 250 grams, the Vortex 150 can be flown nearly anywhere without the need of any typical "Drone Registration" programs. Featuring the latest Fusion 2 Flight Controller System, Twin F3 processors, Tramp Video Transmitter, TNR NFC VTX Tag, DSMX Video Transmitter Control, PitStick Mode, Gen 3 ESC's, the Vortex 150 packs a feature rich punch to the drone market leaving pilots desiring nothing more. Fully Integrated: Fully integrated into this machine is the flight controller, full-graphic OSD, BlackBox recorder, 40-channel video transmitter and a dampened flight camera. Loose wiring in the Vortex 250 Pro is virtually nonexistent for a professional look that’s easy to maintain. Seven 32-Bit ARM Processors: Not many mini-quads out there like the Vortex 150 racer can claim the cutting edge support of seven, fully integrated 32-bit ARM processors. There’s a dedicated ARM for the flight controller, another for the full-graphic OSD, another just for the programmable LED board at the back of the quad and one ARM for each of the four custom high performance ESCs. Tough Construction: Built to survive attempts at cutting down virtually anything in its path, the Vortex 150 is built to take a hit and keep on ticking! Fusion2 + Tramp = Synergy: The new ImmersionRC ‘Synergy’ flight controller integrates a full-graphic OSD and an onboard video transmitter based on the new Tramp HV design. Twin F3 processors ensure an 8kHz loop time and full support of BetaFlight 3.x. Factory calibrated power levels from 1mW -> 600mW, glitch-free channel changing, and a micro-power pit-mode ensure that the Vortex 150 will receive a warm welcome at any race event. The Synergy weighs in at a mere 6.41g, vs. the Fusion Gen2’s 10g, the latter without a video transmitter! Dynamic Power Control: The Dynamic Power Control function of the video transmitter lowers power automatically when the Vortex 150 is disarmed or ready for a race to start so that interference from other racers on the line is minimized. Wireless Video Control: NexWaveRF 5.8 GHz video transmitter technology includes 40 channels of support so that it’s compatible with any 5.8 GHz A/V headset on the market. 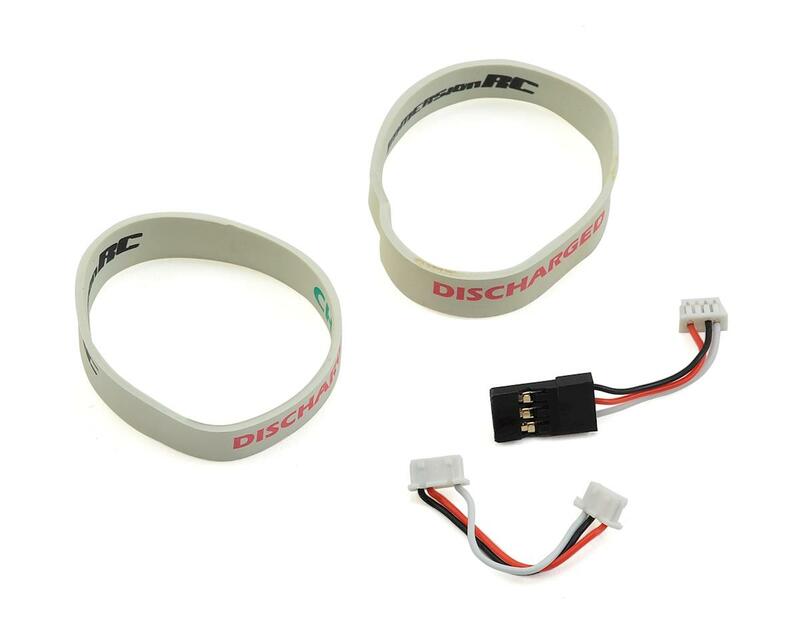 The integrated RaceBand system allows up to eight pilots to fly together and is controlled via the OSD so choosing the clearest channel is all done through the RC transmitter. 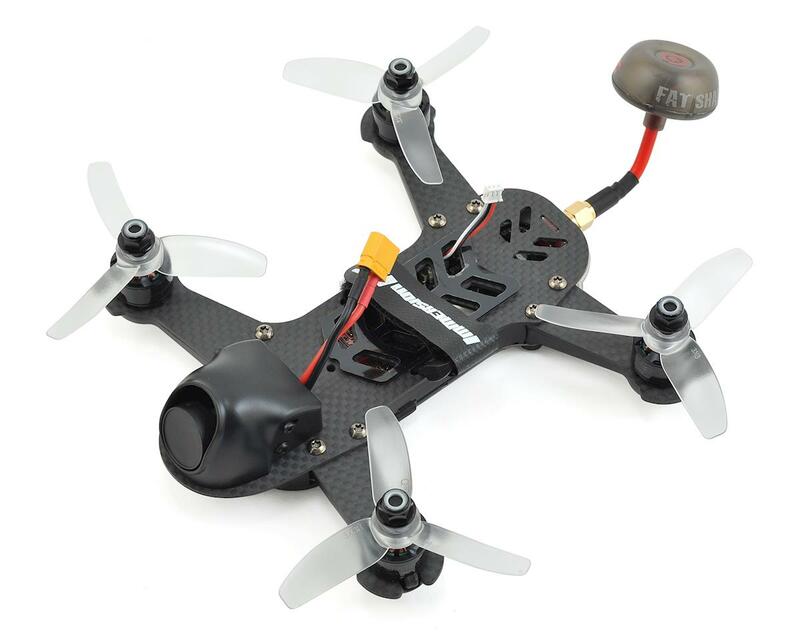 ProTuned: The preloaded firmware has been ProTuned to make this quad fly like its on rails. 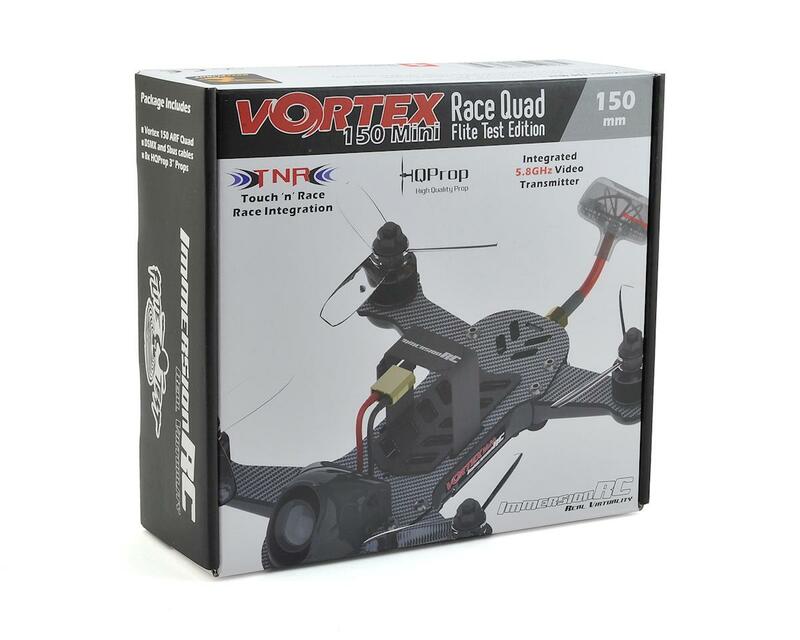 You can explore other ProTune uploads and try out what some of the biggest names in FPV quad racing have shared so that the Vortex 150 Pro can fit your exact performance needs. Bright LEDs and Lost Model Alarm: A set of eight 24-bit RGB LEDs is protected between the upper and lower frames on the tail end. Through a dedicated 32-bit ARM processor, users can program a favorite color, brake lights, turn indicators or just about anything your imagination can conjure. Find it, Fast! : Integrated into the Vortex 150 is a lost model beeper that’s loud enough to be coined “ear piercing.” So if you ever cut loose, the ease of finding your Vortex 150 will help you get back into the game fast. 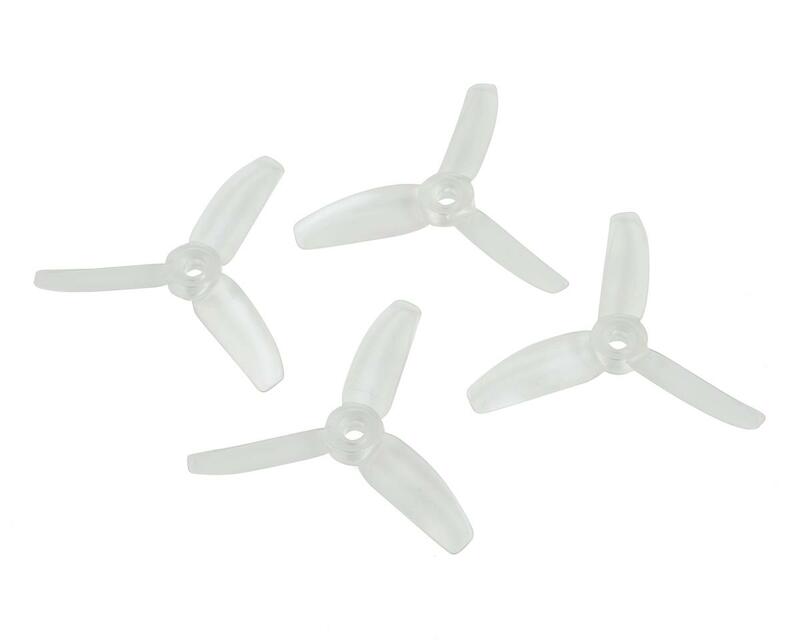 Gen3 32-Bit 16-20A ESC's: Custom 16-20A ESCs supporting all of the common standards provide regenerative braking, for crisp-responsive flight using CleanFlight, or BetaFlight. A 32-bit ARM processor runs each ESC, ensuring plenty of processing power to drive even the most fussy brushless motors. These third-generation ESCs include advanced de-sync detection critical for use with tiny brushless motors running at high rpms. Of course no ImmersionRC ESC would be complete without our innovative rotorSENSE, which programs prop direction with the flick of a finger. No more swapping motor wires. Custom V-Spec Motors: The custom high-speed V-Spec 1304 brushless outrunner motors feature a high-speed rating and spin 3"propellers for the punch to accelerate quickly and conquer the most demanding race courses. BlackBox Recorder: Two megabytes of flash memory has been integrated for BlackBox flight log storage. This powerful capability combines the high-speed data in a way that makes tweaking PIDs (proportional-integral-derivative) to a very specific stabilization need simple. Full Graphic Display with EzOSD: The full-graphic On Screen Display (OSD) on-board provides in-flight updates of critical parameters. The EzOSD menu allows all options to be programmed in the field using the RC transmitter and a headset or monitor. Several OSD layouts are included. A real-time interface with the flight controller enables artificial horizons, fighter-jet style displays and an exchange of flight parameters. All OSD layouts include screen-center alerts for critical warnings such as battery voltage, EzUHF Link Critical and more.